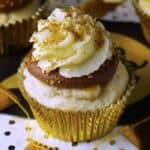 Fluffy white cupcakes topped with a chocolate ganache and mascarpone buttercream, and all of them are infused with a zing of champagne. The perfect New Year’s Eve treat! Preheat oven to 350°F. Line a muffin pan with 12 liners and set aside. In a large bowl, combine dry cake mix, egg whites, coconut milk, melted butter and champagne. Mix on medium speed until well combined. At this point, taste the batter – if you don’t feel like the coconut flavor is too strong for you, you’re done! If it’s too much for you, add vanilla extract. Fill each cupcake liner 2/3-3/4 full and bake for 13 minutes, or until a toothpick inserted into the middle comes out clean. Remove from oven and let cool in pan for a minute. Remove from pan and place on wire rack to cool completely. In a microwave safe bowl, heat heavy cream for 30 seconds – you want it to be hot, but not boiling. Add chopped chocolate and let sit for a few minutes to soften the chocolate. Add champagne and stir to combine completely. Place in fridge to cool for at least 15 minutes. Remove from fridge and whip on high speed until light and fluffy. Once cupcakes are completely cooled, spread or pipe ganache on top of each cupcake. In a large bowl, cream butter and mascarpone cheese until combined and fluffy. Add powdered sugar 1/2 cup at a time and whip on medium-high speed, tasting as you go until it’s as sweet as you’d like. Add champagne and whip again to combine. Pipe on top of the ganache on each cupcake and top with gold sprinkles. Enjoy!